Geldings: Does The Ultimate Equipment Change Actually Impact Performance? As rules surrounding the reporting of a horse's first start as a gelding have changed around the country recently, handicappers have formed opinions about whether or not to bet geldings — and when. It's well-accepted among horsemen that gelding a horse has its benefits, but does it actually result in an improved performance? Statistics have not been compiled about the performances of first-time geldings, but the experts say that the procedure usually has several upsides, including improved training — if done under the right circumstances. Many male horses may need to reach the age of two before they can successfully breed a mare, but they begin to reach sexual maturity around 12 or 14 months of age. That's about the time they can begin showing interest in fillies and can become more challenging for handlers on the ground. As they age, sperm output increases along with scrotal width, and those behaviors can become more pronounced. That behavior can be even more problematic if the horse is injured and requires stall rest for an extended period of time. Extended confinement can give even the kindest horse cabin fever, but for intact colts, it can seem like they've been tossed in a pressure cooker. 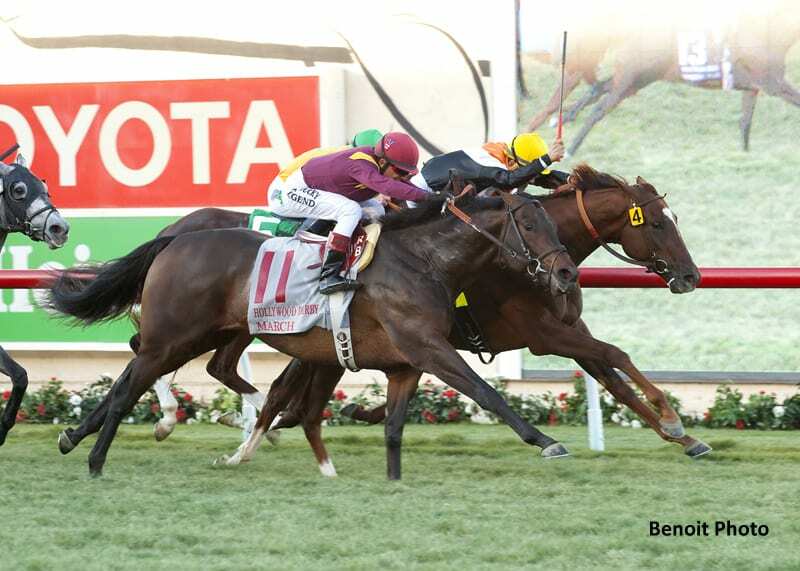 Chiropractor, winner of the Grade 1 Hollywood Derby, suffered a major accident as a yearling and required six months of stall rest followed by six months of hand walking to heal from a back injury. In his case, the gelding procedure seemed like a practical consideration to help him through the recovery process, according to Dreaver. The presence of testosterone naturally in a horse's system also predisposes him to building extra muscle mass and retaining more fat as he develops the thickened neck, larger jaw, and wider body build of a stallion. For some individuals, that growth pattern can outstrip the maturity of their joints. Some horsemen also believe that horses with undiagnosed testicular abnormalities may experience discomfort while galloping as a result. This could include ridglings or cryptorchidism, which occurs when one or both testicles are undescended. In Dreaver's experience, it could even include horses whose testicles appear descended but could be partially caught in the inguinal ring, which surrounds the inguinal canal they must pass through during the descent into the scrotum. The gelding procedure is generally a simple one and is usually performed outside of the clinic. Dr. Jose Bras, surgeon and ambulatory veterinarian at Rood and Riddle Equine Hospital, said the procedure may be done while the horse is standing under sedation or while the horse is lying down under anesthesia. In Bras's experience, post-surgical complications are usually minimal. However, he prefers to give his patients about two weeks to recover before advising they return to heavy work. He does not notice that horses need a race to “adjust” to their movement in the hind legs following a surgery. McLaughlin has found that behavior changes, either in the form of a calmer demeanor or improved work ethic in training, follow quickly after the surgery. Studies show that testosterone levels in the blood drop within 48 hours after gelding. Changes in body shape and musculature could take as long as six months. Bras doesn't believe there are any drawbacks to gelding from an athletic perspective. Bras delivered an important caveat — gelding only works to improve behavior if the horse is fairly young at the time of the procedure. Gelding has another important benefit after the racetrack, too. As Old Friends founder Michael Blowen attests, many rescue organizations are not equipped to house stallions, who require special handling and private paddocks. Just as importantly, Dreaver said Glen Hill often gelds horses with pedigrees the farm thinks should not be reproduced. This entry was posted in Ray's Paddock and tagged chiropractor, dr. jose bras, first-time gelding information, gelding, geldings, Glen Hill Farm, kiaran mclaughlin by Natalie Voss. Bookmark the permalink.